The ACT’s government solar buyback incentive may have ended, but those nice people at Actew AGL say they will pay Canberra folks 11 cents per kWh for any solar energy exported, assuming your system is less than 10 kilowatts for residential tariff customers and less than 30 kilowatts capacity for customers on business tariffs. This is a voluntary scheme and is subject to change as Actew AGL see fit. The 11 cents per kilowatt-hour buyback rate applies to ACT customers on a Standard Retail Contract only. If you bought your solar power system before 1 July 2013 you should be getting a 1:1 solar feed in tariff from Actew AGL. That means you get paid for exports whatever you pay for imports. The lucky ACT folks who installed solar panels under this scheme will be receiving the very generous feed in tariff rate for a period of 20 years from the date the solar power system was connected to the distribution network. Rooftop solar applied for before the 13th of July 2011 could lock in a feed-in tariff which is now a straight 45 cents. It can last for 20 years, so some households will still be receiving this in 2031. 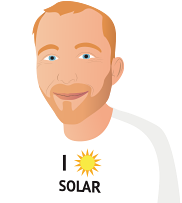 If you are on the 1:1 ACT feed in tariff and you upgrade your system, you will be booted onto the current feed in rate. The only way around this is to install another complete system, and that system will only receive the current rate. If you are on the current FiT, then you have nothing to lose by upgrading. Fill your roof with solar panels and slash your power bills even further! If you are considering an upgrade, I’ve written a detailed page on how to avoid getting burned when upgrading your solar power system. Unlike most Australian states, unfortunately there’s not much choice in terms of electricity retailers for Canberra households – Actew AGL is the only game in town, but perhaps that will change in the future as competition can be a very good thing!